Clearing out my fridge recently I unearthed a little package of dried sourdough starter dated Feb 2016. It was the wheat starter I’d dried as insurance against failure when, in my beginner sourdough baking days, I’d launched into the great unknown and converted my young wheat starter to 100% spelt flour. It was a fortuitous find as in that very same week not only had I read that slow fermentation makes bread made with wheat as digestible as that made with spelt but one of my sourdough support networks alerted me to the publication of “Artisan Sourdough Made Simple” by Emilie Raffa, AKA The Clever Carrot. Emilie’s bread baking journey began in the exact same manner as mine, a gift of dried starter from Celia of Fig Jam and Lime Cordial fame. I was so enthused by what she’d written that before I’d finished perusing my Kindle download, I’d bought a hard copy. For the sake of a little flour and water I had a shot at reactivating the aged dried starter, so I measured out 20g, soaked it in a little water to dissolve the flakes, added equal measures of flour and water and left it for a couple of hours. Not much was happening at this stage, but I fed it again and as I stirred the flour and water through I noticed a feint yeasty smell and a change in the viscosity of the mix. After a few hours I took a peek and there were distinct signs of life, so I fed the starter again, prepared and ate dinner, then relaxed with a glass of wine in front of the TV and promptly forgot all about it. I was preparing to go to bed and saw the bowl on the bench, lifted the lid and was overjoyed to see the starter bubbling so actively I could have mixed some bread dough then and there but instead I gave it a generous feed and left it in the fridge overnight. While the fermentation had slowed by morning my expectation was that by lunchtime I’d be making bread so I added flour and water and it was off like a rocket. I put 140g of the now active starter into storage and mixed the rest into a dough using the 1:2:3 formula, one part starter, two parts water and three parts flour with salt added, 2g per 100g flour. This is the recipe I’ve been using recently for the basis of my spelt loaves and pizza bases so staying with it would enable a good comparison for my palate and my gut. There were some interesting contrasts comparing the handling of wheat dough compared to that made with spelt flour. This dough was much stretchier and much much stickier. The proofed dough was impossible to turn out of the linen lined bannetons I’d prepared in my usual way. It stuck and stretched and pulled and refused to let go. I won in the end but any hopes I had for beautiful looking bread were dashed. The baked loaves may look ugly, but who cares, they taste great. From the outset this dough felt good and I was exceedingly happy with the loaves despite the mishaps. From the grains of doubtful starter to crispy crusted and open moist crumbed loaves you have to love the magic of baking sourdough bread. Put the Ingredients in the order listed into a large non reactive bowl and mix to a shaggy dough. Cover and set aside to rest for 20-30 minutes. Sprinkle flour on the bench then knead the dough until smooth and elastic. Clean the bowl and oil the inner surface. Return the dough to the bowl and cover allow to rest for 45 minutes – 1 hour. Tip the dough onto the bench, no flour this time, then stretch the dough as thin as possible. Fold the dough in on itself until you have a tight boule, return to the bowl, cover and rest in the fridge for 20 – 30 hours. Prepare a bannetton by dusting it with rice flour or alternatively line it with a clean tea towel. Tip the dough onto the bench stretch thinly again then fold, roll and shape your loaf. Place into the bannetton seam side up, cover loosely and allow to rise on the bench until the fermentation begins to slow. You can test this by simply poking with a finger. If the finger indentation fills quickly, the dough need more time but if the hole only refills halfway then the loaf is ready to bake. Tip the dough onto a sheet of baking paper and slash the surface. Lift the dough on the baking paper into a roasting pan, cover and bake for 20 minutes. The crumb looks great, how did your tum cope with it? 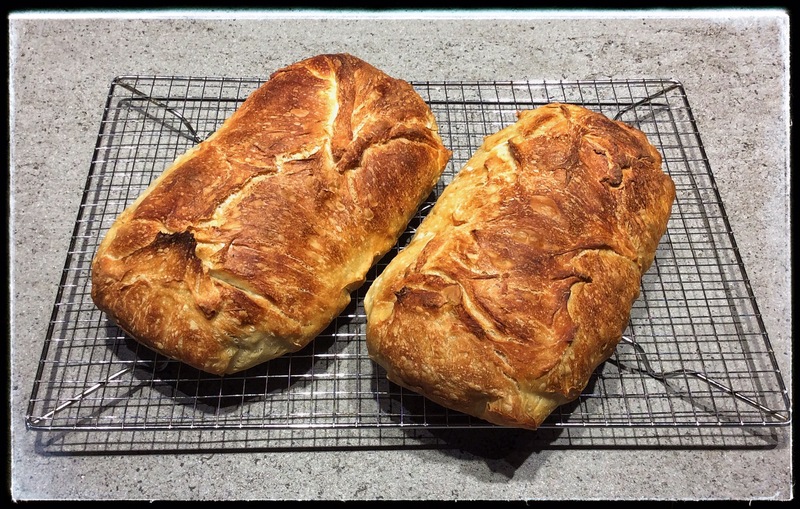 Good solid bread recipe! I make a 100% spelt flour (non-sourdough) bread, but never thought of using spelt in my sourdough starter. My sourdough starter is feed with rye flour. Next feed, I’ll try and get a spelt starter going. Thanks for the post. You should have called those the Lazarus loafs! Good to see your stored start came back to life so brilliantly. I’m waiting for the reversal of my coeliac diagnosis to be confirmed with a blood test, and meanwhile I’ve started baking bread again. I have had some good success with yeast, but if the three month gluten challenge confirms I’m able to eat wheat again whenever I like, I’ll be looking for some ‘daughter of Priscilla’ myself! Oh I hope you find you are able to tolerate wheat afterall, what a blessing that would be. I’d be very happy to supply some dried daughter of Priscilla, just ask…. I’ll hold you to that! Blood test in 3 weeks, meanwhile I’m doing the gluten challenge with no catastrophic side effects, so I have high hopes. Oh, that’s so kind! I do hope you’ll send some idiot proof instructions, too…? It is amazing how long the dried starter lasts. I have some in a plastic bag stuffed in a drawer here in Greece that is still viable – tested just a little while ago when I feared my refrigerated starter was a bit too flat (left too long while on holiday). Glad it worked out for you. It is amazing really, incredibly robust. Hi Sandra, the crumb looks fab. I bet it tasted great. I still have dried starter I made about 5 years ago. I wonder if that is still viable. Give it a go Glenda, I reckon it will work. I posted the pic on the FB sourdough group I belong to and lots of people commented about the age of starters they’ve revitalised. Seems like you can’t keep a good starter down. Should be fine Glenda, I have restarted some at least 3 possibly more years old. Nothing to lose! 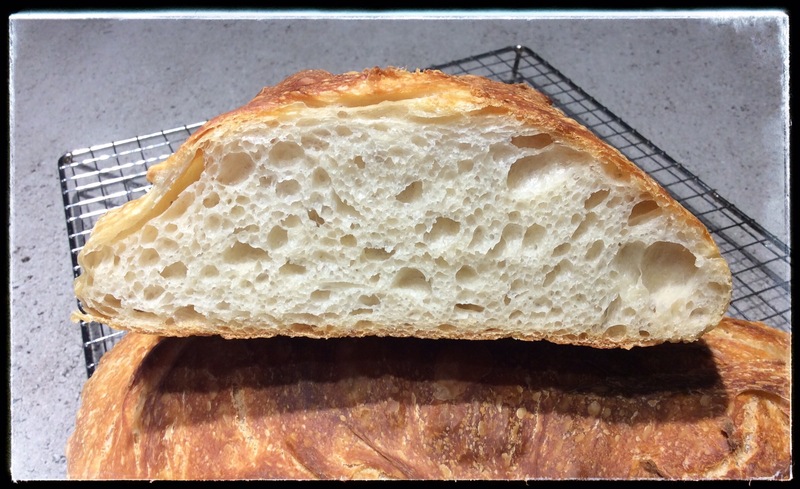 This entry was posted on November 9, 2017 by ladyredspecs in Baking, bread, Breakfast and Brunch, Cooking, FODMAP diet, Food, sourdough bread and tagged sourdough bread.